It may come as a surprise to some that my personal aesthetic leans quite modern. There are a variety of reasons while my own home will never look like Charles and Ray Eames designed it - I often wonder how they would design around a collection of matchbox cars and superhero figures - but as I grow older, my taste has really narrowed toward clean lines, open spaces, large windows, and a feeling of overall lightness. I start to draw the line at complete starkness and minimalism, however, for its seeming impracticality (again, kids) and lack of personality (namely, mine - I enjoy having personal vignettes around the house). A strict follower of modern design would probably balk at the more traditional elements in my home, but I still firmly place myself on that end of the design spectrum. Therefore, it should be no surprise that Palm Springs - the epicenter of mid-century modern design in America - was at the top of my list of must-see destinations in California. And the quick, 2.5 hour drive from San Diego meant that we had reservations for a little getaway within the first three weeks of our arrival. (The 100 degree desert heat didn't deter me.) And I was not disappointed with what we found. 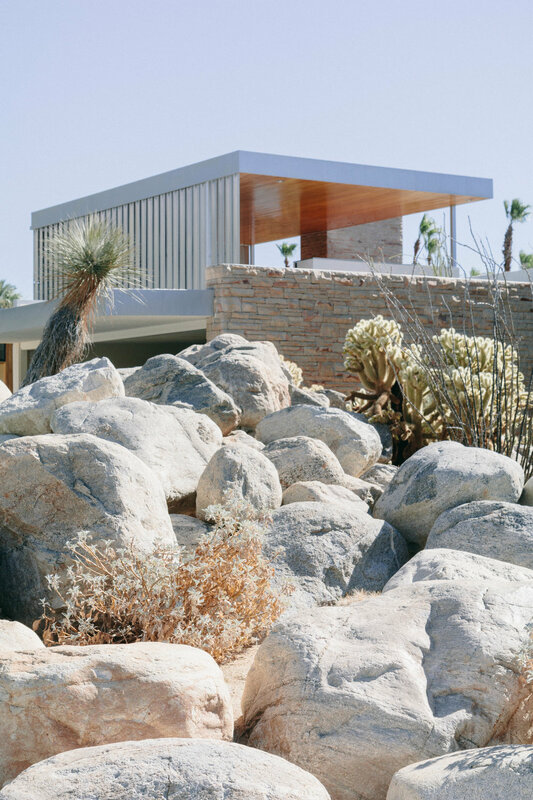 The best tip we received for finding these beautifully designed homes was on the Pathport guide to Palm Springs, which recommended that we download the self-guided design tour from the Palm Springs Visitors' Center. It highlights all the well known structures designed by famous architects, like Richard Neutra's Kauffman House (top left), but it also gives interesting background on some lesser known designs. Some house hunters, myself included, might be disappointed that a number of the featured homes are tucked way back off the street, behind large gates, and away from the prying eyes of observers. That's when a walk down a street like N. High Road is in order. These mid-century gems are on full display for everyone to enjoy. Now, for some travel notes: if you are interested in staying in a design-oriented hotel, you have two great options available to you. First up, the Ace Hotel & Swim Club. The star of the show here is the pool scene, but the overall retro vibe of this renovated mid-century motel is good fun. The other option is the Parker Palm Springs, an interior design lover's heaven. It is an iconic Palm Springs hotspot for obvious reasons. My husband and I swear that we'll stay here on a child-free getaway, but I'd be lying if I didn't admit that my daughter was all about the cool designs featured here.